Chang, L., Guo, W., and Tang, Q. (2017). "Assessing the tensile shear strength and interfacial bonding mechanism of poplar plywood with high-density polyethylene films as adhesive," BioRes. 12(1), 571-585. A series of high-density polyethylene (HDPE) films were tested as adhesives for plywood and were fabricated using hot pressing followed by cold pressing. The effects of the moisture content, HDPE dosage, and the hot-press temperature and pressure on the mechanical properties were evaluated by analyzing the tensile shear strength. The results indicated that the HDPE films that were used as adhesives in plywood had good bonding strength, meeting the requirements for type II-grade plywood according to the GB/T 9846.3 standard (2004, Beijing, China). The bonding mechanism was also investigated using the width of the bond line, the average penetration (AP), and the effective penetration (EP) through the use of optical microscopy and scanning electron microscopy (SEM). The results showed that the HDPE is able to penetrate into the vessels, xylem, and so on. On the whole, both the AP and EP increased with an increase in the HDPE dosage and hot-press temperature and pressure, but not with an increase in the moisture content. In addition, the effects of the factors mentioned above on the width of the bond line, AP, and EP were also investigated by an ANOVA analysis. Plywood that has been fabricated using veneers and adhesives is one of the most important wood-based composites, and it has been extensively applied in various areas, such as ﬂoors and interior panels (Fang et al. 2013, 2014). However, conventional wood adhesives are mainly formaldehyde-based adhesives, such as urea–formaldehyde (UF) resins, phenol–formaldehyde (PF) resins, and melamine urea–formaldehyde (MUF) resin. The use of these adhesives leads to the emission of formaldehyde during production, introducing hazardous material to the environment and to human health. (Sellers 2001; Fang et al. 2013). With recent changes in people’s attitudes towards environmental awareness and human health, the development of plywood with formaldehyde-free alternative adhesives has received increasing attention in recent years from both industrial communities and academic circles. As a kind of wood plastic composite (WPC), plywood has advantages of high manufacture efficiency and wide applications (Fang et al. 2013). In the research field of WPC, to improve bonding properties, plastic must penetrate the wood before it is cured. Nevertheless, recent studies on resins used as adhesives have mainly focused on macroscopic examination of panel properties (Mahlberg et al. 2001; Yuan et al. 2004; Kaboorain et al. 2008; Goriparthi et al. 2012; Wei et al. 2013; Lou et al. 2013). Wood is a porous material, and thus adhesive penetration plays an important role in wood adhesion. To facilitate adequate mechanical interlocking, the adhesive must penetrate the wood before it is cured. 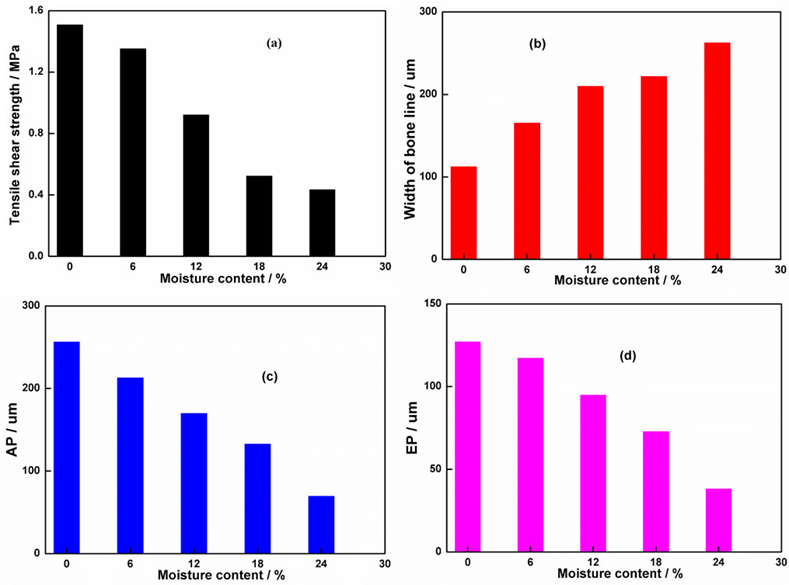 Traditional wood plastic composites take wood powders or fibers as raw materials, and many authors have reported results for the penetration of adhesives (Gavrilovic-Grmusa et al. 2012a,b, 2016; Guan et al. 2013). 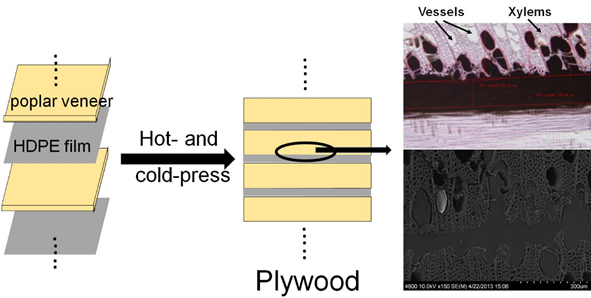 However, in such composites the wood unit is tiny and does not have its complete structure, so it is poorly suited to research concerning the impregnation path of resins in wood (Li et al. 2013; Sheshmani et al. 2013; Shamsul and Srivastava 2016; Ye et al. 2016). Wood plastic composite plywood uses veneer as the raw material, with bigger wood unit size and more complete wood structure. However, few authors have been reported about the interface penetration of veneers, so the study on interface penetration of veneers is instructive. Tensile shear strength is one of the most important mechanical properties of plywood. The primary factors that govern the tensile shear strength of plywood can be classified as follows: (Gavrilovic-Grmusa et al. 2012a,b, 2016) (1) wood-related factors, such as the diameter of the lumen and the exposure on the wood surface; (2) adhesive-related factors, such as the viscosity of HDPE; and (3) hot-processing-related factors, such as time, temperature, pressure, and moisture content. Thus, it can be seen that characterization of the effects of such factors on the tensile shear strength of plywood is of vital importance. High-density polyethylene (HDPE) ﬁlm is a next-generation formaldehyde-free adhesive for plywood that is inexpensive and relatively tough. It also has good dimensional stability and most importantly, environmental superiority (Han 1990; Fang et al. 2013). However, the mechanisms that govern the bonding properties, as a function of the factors mentioned above on a micro-scale, are still not well understood. Therefore, the objective of this research was to investigate the effects of the factors mentioned above on the tensile shear strength of plywood that uses HDPE as an adhesive. Moreover, the microscopic detection of the penetration of the adhesive into the wood tissue was also carried out by optical microscopy and scanning electron microscopy (SEM). The width of the bond line, the maximum penetration depth (MP), and the effective penetration depth (EP) were used to evaluate the penetration status of HDPE in veneers. Poplar veneers were purchased from the Renqiu Test Forest Base (Hebei, China). The veneer’s dimensions were 300 mm × 300 mm × 1.6 mm, and their moisture content was 6%. The moisture contents in veneers (12%, 18%, and 24%) were conditioned by using a constant temperature and humidity test chamber (JHS-150, Chinese Judao Scientific Instrumental Co. Ltd., China) and 0% was dried by a blast oven (DHG-9140A, Shanghai Yiheng Scientific Instrumental Co. Ltd., China). Analysis of Variance (ANOVA) is analyzed by the soft of Design-Expert purchased from Stat-Ease Inc. (Minneapolis, USA). The HDPE films were purchased from the Beijing Yanshan Petrochemical Corporation (China), with a thickness of 0.06 mm, and a density of 0.9 g/cm3. The plastic films were cut into the same dimension as the veneers; red dye and T0 biological agent were bought by the Tianjin Guangfu Fine Chemical Industry Research Institute (China) and the Guangxi Cenxi Tianxing Forestry Chemistry Co. Ltd. (China), respectively. Five-layer wood–based plywood was assembled alternatively with five poplar veneers and HDPE films by a hot- and cold-press, as shown in Fig. 1. The plywood was prepared with the grain directions of the two adjacent veneers perpendicular to each other. Hot pressing conditions of moisture content, HDPE film dosage, hot-press pressure and temperature, play an important role in the physical-mechanical properties of plywood. Therefore, it is necessary to investigate the effects of fabrication conditions on the physical-mechanical properties of plywood. The exact data of moisture content, HDPE film dosage, hot-press pressure and temperature, are summarized in Table 1. Three parallel plywood boards were prepared at each condition. The following example is given for the manufacturing of plywood from the veneers having the moisture content of 0%. Each plywood was placed on one platen, with 5 layers HDPE between two veneers after the platens were heated up to 160 °C. A pressure of 1.0 MPa was applied on the laminate, and the pressure was maintained for 6.4 min and followed by a cold-press. At this point, three plywood boards had been fabricated. where yi represents the five farthest penetrative distance of adhesive in the bonding interface. where Ai is the total penetrative area at the constant distance of bondline (X0). X0 is the length of bondline of micrograph. The width of the bond line is illustrated as T. All of the parameters are shown in Fig. 2. The viscosity was investigated using a Capillary Rheometer (CFT-500D, Shimadzu Corporation, Japan). The tested temperatures were 140, 150, 160, 170, and 180 °C. The tensile shear strength was investigated according to the Chinese National Standard (GB/T 17657 1999. Before testing, all the samples were conditioned for 1 week at 25 °C and 65% relative humidity. The tensile tests were carried out at a crosshead deformation speed of 5 mm/min on a Multi-Function Mechanical Testing machine (Jinan Shijin Co., Ltd, 10 kN, Jinan, China). For each condition, at least six specimens were tested from each plywood, giving the average bonding strength of 18 (3×6) specimens for statistical significance. The SEM of slices of this material after metallizing with gold-palladium was done using a Hitachi S-520 scanning electron microscope (SEM, Hitachi Group, Japan). Test-specimens with 20 µm thick microtome sections were prepared by using a sliding microtome apparatus, exposing a bond line with a cross-sectional surface. The specimens that were prepared as the same method above are dyed with a red dye. The specimens were then decolorized in three steps: first, 75%, 95%, and 100% graded ethanol was used; second, the miscible liquids of ethanol: T0 biological agent= 1:1 was used; and third, 100% T0 biological agent was used. Subsequently, the specimens were loaded between two glass slides for characterization. The viscosity of the melted HDPE film had a large influence on its penetration. 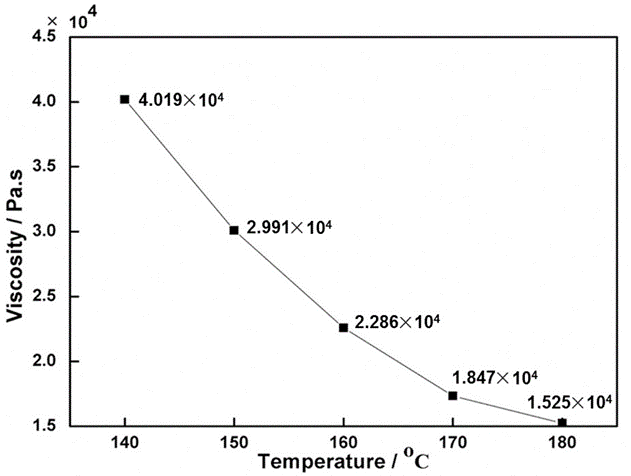 The relationship between viscosity and temperature is shown on Fig. 3. It can be seen that the viscosity decreased gradually with an increase temperature from 140 °C (40190 Pa∙s) to 180 °C (15250 Pa∙s). This is due to the acceleration of molecular motion at high temperatures, which reduced the degree of entanglement between the molecules, thus helping to reduce the viscosity. It is known that the moisture content plays an important role in tensile shear strength. The plots of tensile shear strength as a function of moisture content are displayed in Fig. 4, which gives clear insight into the bonding properties. For this part of the experiments, the fabricated plywood was hot pressed at 160 °C and 1.0 MPa for 6.4 min, followed by cold pressing. The tensile shear strength in the veneers showed a large decrease with an increase in the moisture content ranging from 0% to 24% (Fig. 4(a)). The tensile shear strength of the plywood decreased from 1.508 to 0.921 MPa when the moisture content increased from 0% to 12%, thus meeting the requirements for type II-grade plywood given in the Chinese National Standard (GB/T 9846.3 2004; GB/T 9846.7 2004). As the moisture content increased to 18% and 24%, it can be seen that the tensile shear strength was below 0.7 MPa. 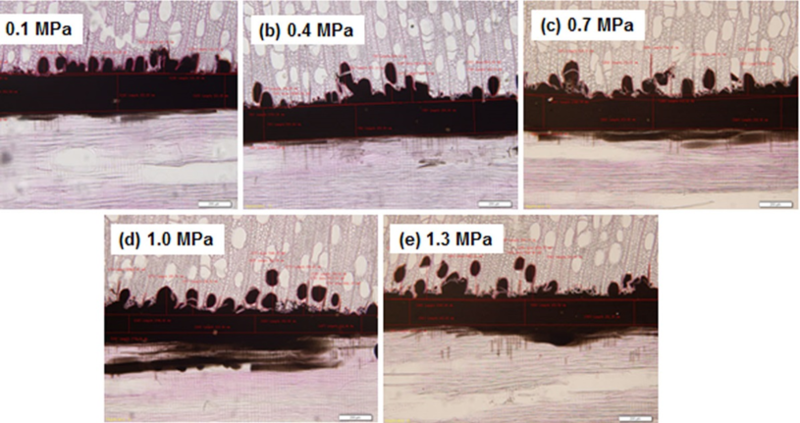 In order to better understand the varied tensile shear strength of plywood, a morphological analysis of the cross section between the veneers and the HDPE resins using optical microscopy observations was carried out. The results are shown in Figs. 5a-5e. It can be seen that the width of the bond line decreased with increasing moisture content (Fig. 4 and Fig. 5). As shown in Fig. 5, when the moisture content was 0%, the HDPE penetrated into 3 to 5 of the vessel layers and much of the xylem. These results indicate that the HDPE ﬁlm was able to ﬂow and penetrate into the vessels of the wood substrate to form many bonded joints. These bonded joints resulted in mechanical interlocking, which strengthened the plywood. As the moisture content increased, less of the HDPE could penetrate into the vessels, that is to say, MP and EP decreased gradually. Subsequently, when the moisture content increased up to 24%, almost no HDPE resin could penetrate into the vessels and wood fiber (Fig. 5(e)). The poor penetration resulted in poor interfacial adhesion, thus leading to a lower tensile shear strength. These results can be attributed to the fact that wood is hydrophilic; when the moisture content increases, the hydrophilic hydroxyl content increases. However, HDPE is hydrophobic, and thus veneers with higher moisture contents have poorer compatibility with HDPE, leading to less mechanical interlocking between HDPE and the veneers. To investigate the extent of the influence of moisture content on the width of the bond line and the MP and EP of the resulting plywood, an analysis of variance (ANOVA) was carried out, and the results are presented in Table 2. The ANOVA analysis results indicated that the moisture content had an extremely significant effect on the bond line and the MP and EP (Pr < 0.01) in the statistical analysis. Further, according to the F values, the effect of the factors is in the order of width of bond line > MP > EP. Figure 6 shows that the tensile shear strength of the plywood varies with the HDPE dosage. An obvious increase in the strength with an increase number of HDPE layers was observed. Furthermore, all of the panels had strengths higher than 0.7 MPa, indicating that all of the samples met the requirement for the type II-grade plywood given in the Chinese National Standard (GB/T 9846.3 2004). These results were interpreted by characterizing the cross-section of the plywood through optical microcopy. It was determined that the greater the HDPE dosage, the more HDPE permeated the vessels and porous structure of the wood, and thus the greater the formation of mechanical interlocking joints, which helped to improve the bonding strength, as confirmed in Figs 7a to 7e. In Fig. 7, it is observed that the HDPE penetrated only 1 to 2 vessel layers when the HDPE dosage was 1 layer. However, more of the vessels, rays and wood fiber were filled with an increase in the numbers of HDPE layers, as shown in Figs. 7(b) to 7(e). This was also confirmed by the variations of MP and EP with the HDPE dosages (Figs. 7c and 7d), respectively. Similarly, the width of the bond line also increased with an increase numbers in the number of HDPE layers. By analyzing Fig. 6b carefully, it can be seen that the width of the bond line increased slowly before 3 layers, but after 3 layers, the width began to increase greatly. This maybe because the penetrative ability of HDPE was close to the saturated state at this point, and thus additional HDPE films could only accumulate in the bond line. This also may explain the slow increase of the tensile shear strength with 3 to 5 layers of HDPE. Table 3 shows the extent of the influence of HDPE dosage on the penetrative property of the resulting plywood by an ANOVA analysis. It can be seen that the width of the bond line and MP and EP were significantly affected by the HDPE dosage because the P-values are less than 0.01. Nevertheless, according to the F-values, it can be seen that the HDPE dosage affected the width of the bond line the most, followed by the MP, then lastly the EP. Figures 8a through 8d show the tensile shear strength of the plywood under different hot-press temperatures. As expected, a clear and regular increase in the bonding strength occurred with an increase in the temperature during fabrication. In contrast, the strength decreased gradually after the hot-press temperature increased to 160 °C. 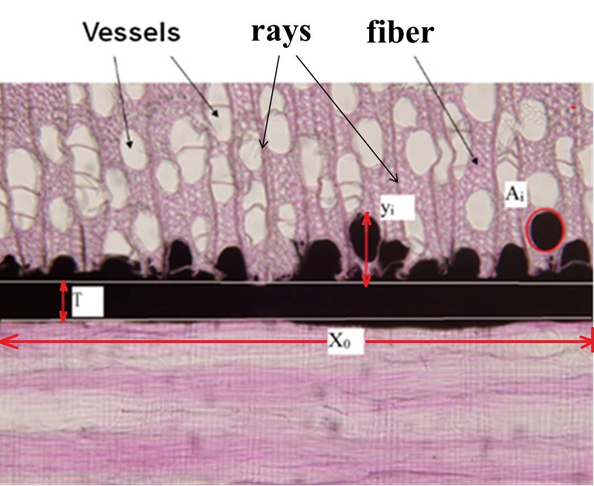 In order to interpret these abnormal results, cross sections of the plywood were characterized by optical microscopy, and the results are shown in Fig. 9. Considering Figs. 8 and 9, the changes of strength might be related to the penetration of the HDPE resins in the plywood. As seen in Figs. 8 and 9, the penetrative properties (MP and EP) increased with an increase in the temperature before 160 °C (Figs. 8c and 8d, respectively), contributing to the formation of more mechanical locks and thus to increased bonding strength. However, it should be noted that after 160 °C, although the MP and EP did increase, the HDPE resins penetrated isolated vessels, thus failing to form a continuous and homogeneous bond line, leading to poorer bonding strength. As can be seen in Fig 8b, the width of the bond line decreased with increasing hot-press temperatures. This was because the HDPE exhibited lower viscosity at high temperatures, which helped improve the penetrative properties and reduce the width. According to the ANOVA results in Table 4, the width of the bond line, the AP, and EP, were also significantly affected by the hot-press temperature, i.e., the P-values were less than 0.01. Further, according to the F-values, it can be seen that the extent of the influence was in the order of MP > EP > the width of bond line. In plywood composites, the hot-press pressure mainly governs the tensile shear strength during fabrication. The tensile shear strength values, as a function of pressure, are plotted in Fig. 10. As presented in Fig. 10a, the relationship between the tensile shear strength of the plywood and the pressure was the same as that for the hot-press temperature, i.e., all of the tensile shear strengths were higher than 0.7 MPa. 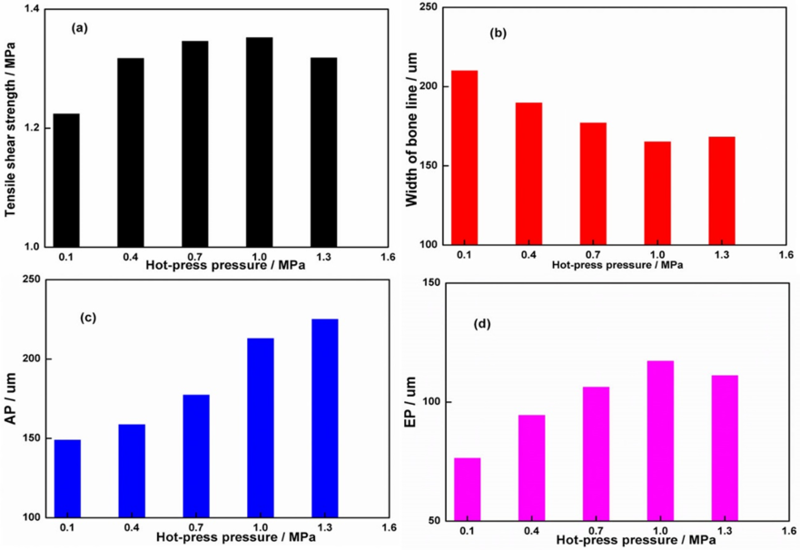 As expected, before 170 °C, the tensile shear strengths increased with increasing hot-press pressures; nevertheless, as the temperature increased to 170 °C, the strength started to decrease. A detailed characterization by optical microscopy is exhibited in Figs. 11a through 11e). With increasing pressure, more of the HDPE film was pressed into the vessels of the veneers, ranging from a 1-layer vessel at 0.1 MPa (Fig. 11a) to a 3-layer vessel at 1.3 MPa (Fig. 11e), meaning that the HDPE films can form excellent bonded joints between plastics and veneers. Therefore, high pressure is recommended to improve the adhesion properties with the veneers. However, when the hot-pressure increased to 1.3 MPa, the strength decreased. As is known, in this case, the pressure of the cold pressing stage (1.0 MPa) was lower than the pressure of hot press, probably resulting in the rebounding of the HDPE resin in vessels and cavities, and thus reducing the tensile shear strength. To study the extent of the influence of the hot-press pressure on the width of the bond line, MP, and EP of the resulting plywood, an ANOVA of these parameters was performed, and the results are summarized in Table 5. The ANOVA results indicated that the hot-press pressure had a significant effect on the width of the bond line, the MP, and EP. Further, according to the F-values, the hot-press pressure had the biggest influence on MP, followed by EP and the width of bond line, in that order. To investigate the bonding mechanism of HDPE, SEM images of the micromorphology of the interface between the veneers and the HDPE are shown in Fig. 12. In Fig. 12a, it can be seen that the HDPE penetrated the vessels and the xylem of the veneers, which is consistent with the optical microscopy analysis. 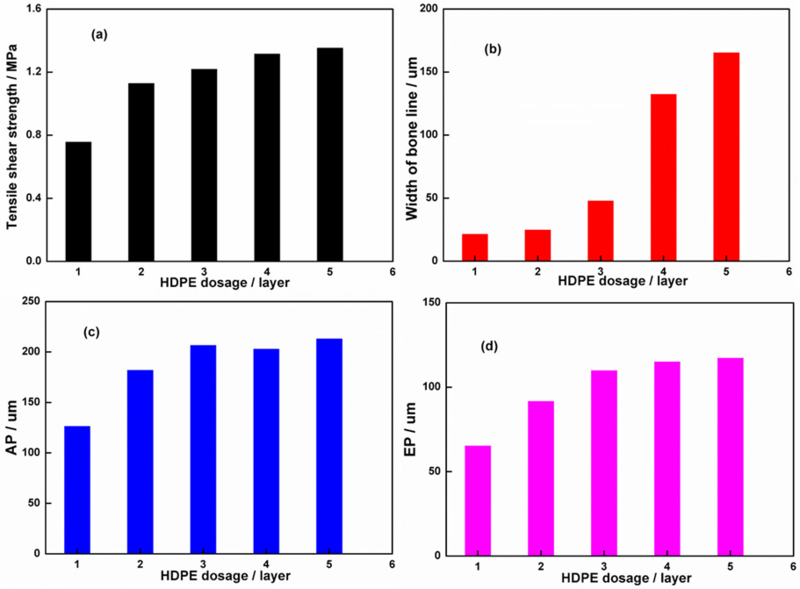 However, there was a clear de-cohesion or de-bonding between the HDPE resins and the vessels due to their poor compatibility, which is observed in Fig. 12b. Further, in Fig. 12c, it can be seen that there was a notch in the HDPE resin, which is in complete agreement with the morphology of the cell wall. Thus, it can be inferred that the HDPE resin and the cell wall were already in contact during hot-pressing, but because of the poor compatibility, the HDPE shrank after the pressure was diminished. In addition, it should be noted that the HDPE penetrated into the pits of vessels (Fig. 12d), which contributed to mechanical interlocking while also helping to improve the bonding property. In this work, plywood samples with HDPE films, as adhesives, were prepared using hot-pressing conditions, followed by cold pressing. 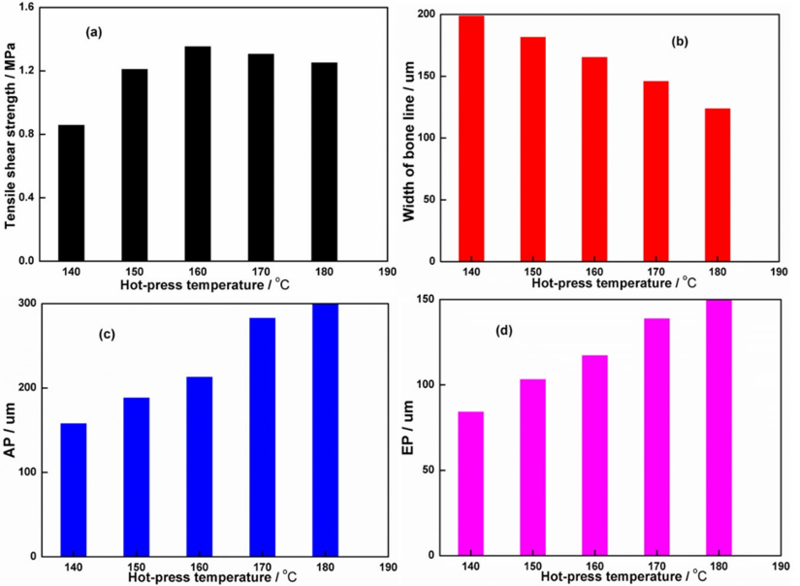 The viscosity of the melted HDPE films decreased gradually with an increase in the temperature from 140 °C (40, 190 Pa∙s) to 180 °C (15, 250 Pa∙s). An evaluation of the mechanical performance of the plywood was conducted using tensile shear strength. The results indicated that the manufactured plywood is able to meet the requirements for type II-grade plywood given in the Chinese National Standard (GB/T 9846.3 2004). 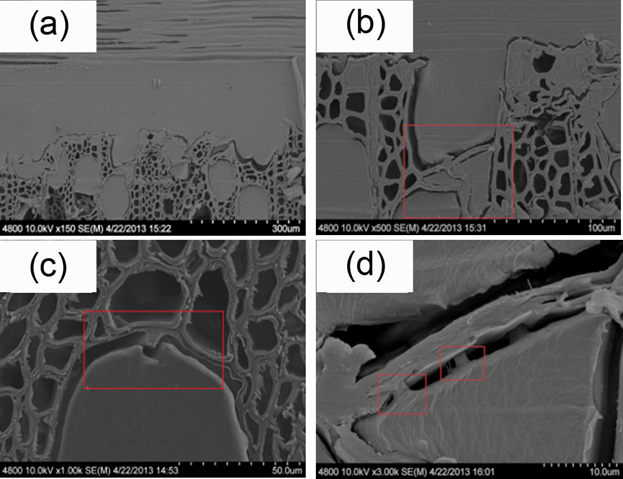 SEM and optical microscopy proved that the HDPE resins penetrated into the lumens of vessels rays, and wood fiber near the bondline, contributing to mechanical interlocking and filling the plywood with excellent bonding properties. With an increase HDPE dosage, hot-press temperature, and pressure, the MP and EP showed a tendency to increase. On the other hand, the results showed an inverse trend with an increase in the moisture content. However, the width of bond line exhibited results contrary to those of MP and EP. To investigate the effect of the factors on the width of the bond line, MP, and EP, an ANOVA was performed. The extent of the influence of the moisture content and the HDPE dosage was in the order of width of bone line > MP > EP; the extent of the influence of the hot-press temperature and pressure, was in the order of MP > EP > width of bone line. The authors are grateful for the support of the Special Fund of Chinese Central Government for Basic Scientific Research Operations in Commonweal Research Institutes (NO.CAFYBB2014QA020 )for financial support. Fang, L., Chang, L., Guo, W. J., Chen, Y. P., and Wang, Z. (2014). “Inﬂuence of silane surface modiﬁcation of veneer on interfacial adhesion of wood–plastic plywood,” Appl. Surf. Sci. 288, 682-689. Febrianto, F., Karliati, T., and Sahri, M. H. (2006). “Trans-1,4-isoprene rubber as hot melt adhesive,” Biological Sciences 6(3), 490-500. Gavrilovic-Grmusa, I., Dunky, M., Iporovi-Momilovi, M., Popovi, M., and Popovi, J. (2016). “Influence of pressure on the radial and tangential penetration into poplar wood and on the shear strength of adhesive joints,” BioResources 11(1), 2238-2255. GB/T 17657 (1999). “Test methods of evaluating the properties of wood-based panels and surface decorated wood-based panels,” Standardization Administration of China, Beijing, China. GB/T 9846.7 (2004). “Plywood-Part 7: Cutting of test specimens,” Standardization Administration of China, Beijing, China. Han, G. S. (1990). “Preparation and physical properties of moldable wood-plastic composites,” Japan: Kyoto University. Lou, C. W., Lin, C. W., Huang, C. H., Hsieh, C. T., and Lin, J. H. (2013). “Compatibility and mechanical properties of maleic anhydride modified the wood plastic composites,” J. Reinf. Plast. Compos. 32(11), 802-810. DOI: 10.1177/0731684413480250. Sellers, T. J. (2001). “Wood adhesive innovations and applications in North America,” Forest Prod. J. 51(6), 12-22. Article submitted: July 29, 2016; Peer review completed: October 2, 2016; Revised version received: November 14, 2014; Accepted: November 15, 2016; Published: November 28, 2016.